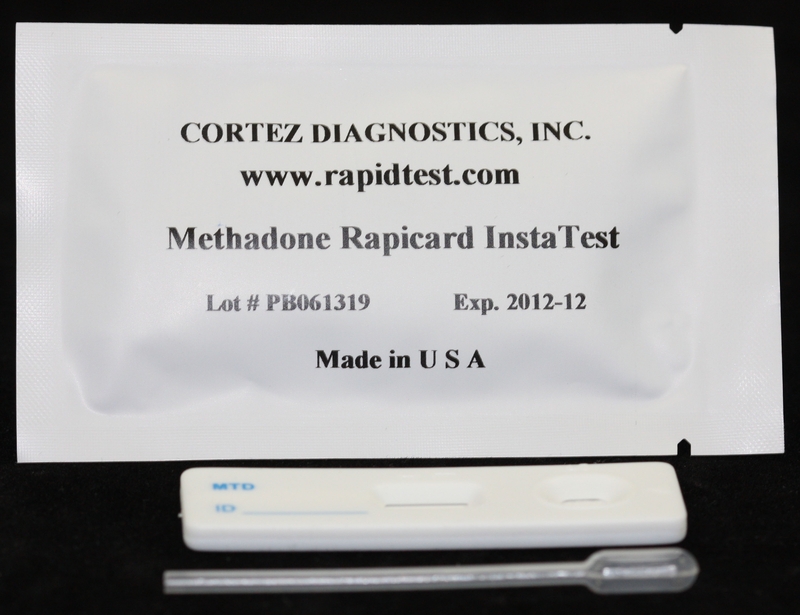 Los Angeles based Diagnostic Automation/Cortez Diagnostics, Inc. offers a 6 Panel Drug Test for any combination drugs: (AMP) Amphetamine drug test, (BZD) Benzodiazepine drug test, (COC) Cocaine drug test, (MET) Methamphetamine drug test, (MTD) Methadone drug test, and (MOR) Morphine drug test. This multi drug test kit is designed for qualitative determination of drug substances in human urine specimen. 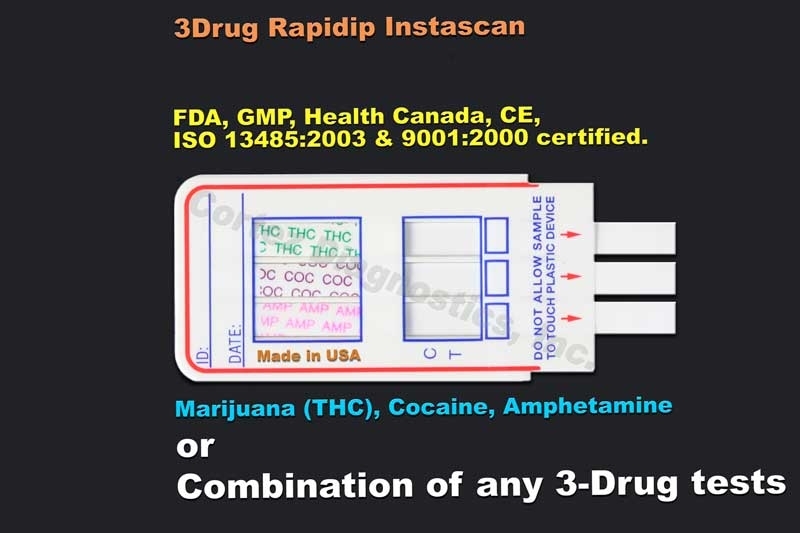 The 6 Panel - (AMP) Amphetamine drug test, (BZD) Benzodiazepine drug test, (COC) Cocaine drug test, (MET) Methamphetamine drug test, (MTD) Methadone drug test, and (MOR) Morphine Drug Testing device is based on the principle of specific immunochemical reaction between antibodies and antigens to analyze particular compounds in human urine specimen. The assay relies on the competition for binding antibody between drug conjugate and free drug which may be present in the urine specimen being tested. When the Amphetamine (AMP), Benzodiazepine (BZD), Cocaine (COC), Methamphetamine (MET), Methadone (MTD), or Morphine (MOR) drug is present in the urine specimen, it competes with drug conjugate for the limited amount of antibody-dye conjugate. When the amount of the Amphetamine (AMP), Benzodiazepine (BZD), Cocaine (COC), Methamphetamine (MET), Methadone (MTD), or Morphine (MOR) drug is equal or more than the cut-off, it will prevent the binding of drug conjugate to the antibody. 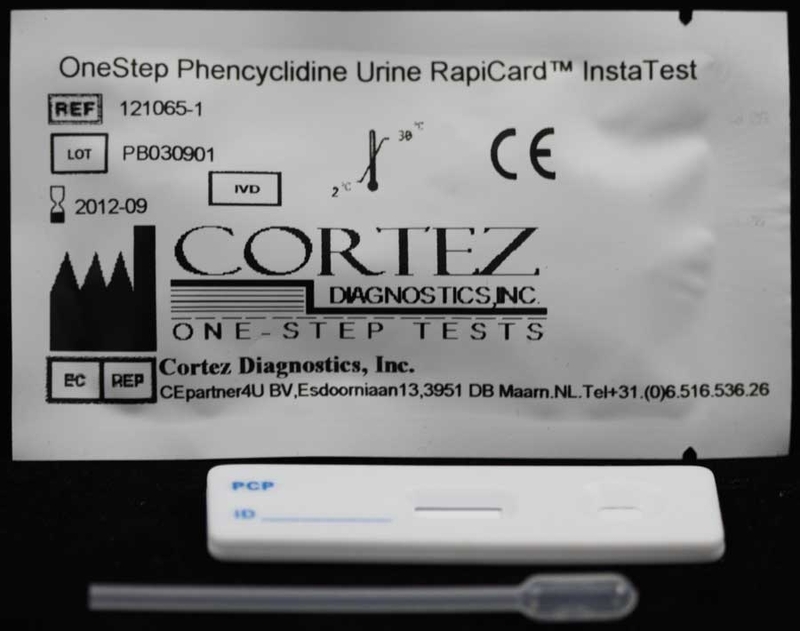 Therefore, a positive urine specimen on this 6 Panel Drug Test will not show a colored band on the test line zone, indicating a positive result, while the presence of a colored band indicates a negative result. A control line is present in the test window to work as procedural control. 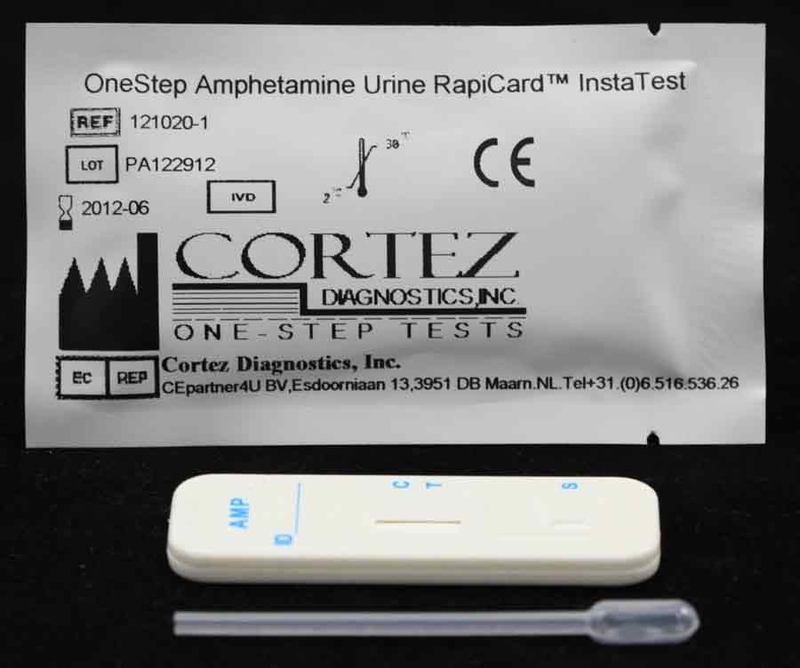 This colored band should always appear on the control line zone if the 6 Panel Drug testing device is stored in good condition and the 6 Panel Drug Test- (AMP) Amphetamine drug test, (BZD) Benzodiazepine drug test, (COC) Cocaine drug test, (MET) Methamphetamine drug test, (MTD) Methadone drug test, and (MOR) Morphine drug test is performed appropriately. Amphetamines, potent sympathominetic agents, are central nervous stimulants which cause the neutrotrransmitters epinephrine, norepinephrine and dopamine to be released into the brain and body causing euphoria, alertness, and increased energy, and in more acute cases producing anxiety, paranoia, hallucinations and psychotic behavior. Benzodiazepines are central nervous system depressants that can result in addiction and lead to drowsiness, dizziness, muscle relaxation, lethargy, coma, and possible death. Cocaine, from cocoa plant leaves, is a potent central nervous system stimulant which could induce physiological dependency. Methadone, a synthetic opioid that acts on central nervous system to produce respiratory and circulatory depression, is used for treatment of severe pain and in maintenance for morphine and heroin addictions, and in high doses induces analgesia, sedation, respiratory depression and coma. Methamphetamine, a synthetic amphetamine derivative, is a potent sympathomimetic agent that leads to euphoria, alertness, reduced appetite, and increased energy with acute doses producing anxiety, paranoia, psychosis, and cardiac dysrhythmias. Morphine (MOR) is an opioid analgesic, the principal and most active alkaloid of opium. Acute high doses of opiates-heroin-morphine drugs used by abusers or addicts can cause depressed coordination, disrupted decision, decreased respiration, hypothermia and coma. 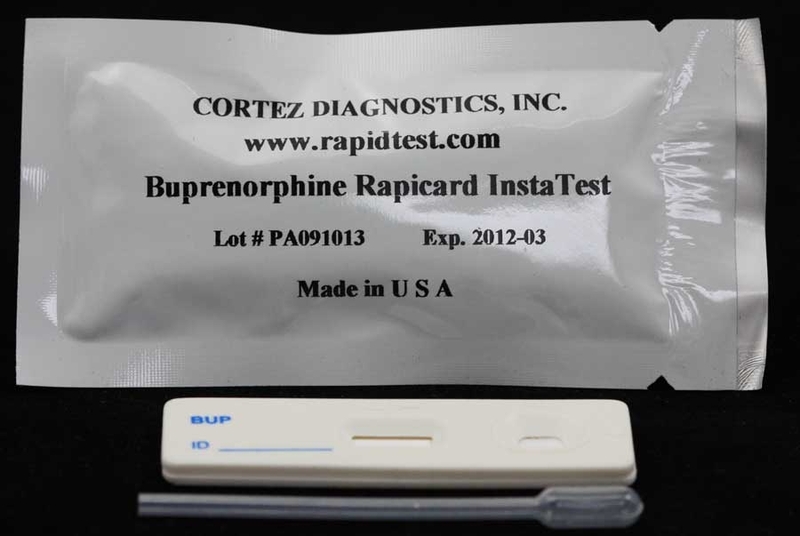 The six panel drug test kit-(AMP) Amphetamine drug test, (BZD) Benzodiazepine drug test, (COC) Cocaine drug test, (MET) Methamphetamine drug test, (MTD) Methadone drug test, and (MOR) Morphine drug test provides only a preliminary analytical test result. A more specific alternative chemical method must be used in order to obtain a confirmed analytical result. Gas chromatography/ mass spectrometry (GC/MS) has been established as the preferred confirmatory method by the Substance Abuse Mental Health Services Administration (SAMHSA). Clinical consideration and professional judgment should be applied to any drug of abuse test result, particularly when preliminary positive results are indicated. The optional built-in Adulteration Test is for validation of urine specimenâ€™s integrity and must not be used for In Vitro diagnostic use. For customized cutoff levels for any multi panel drug tests, please contact Customer Service. 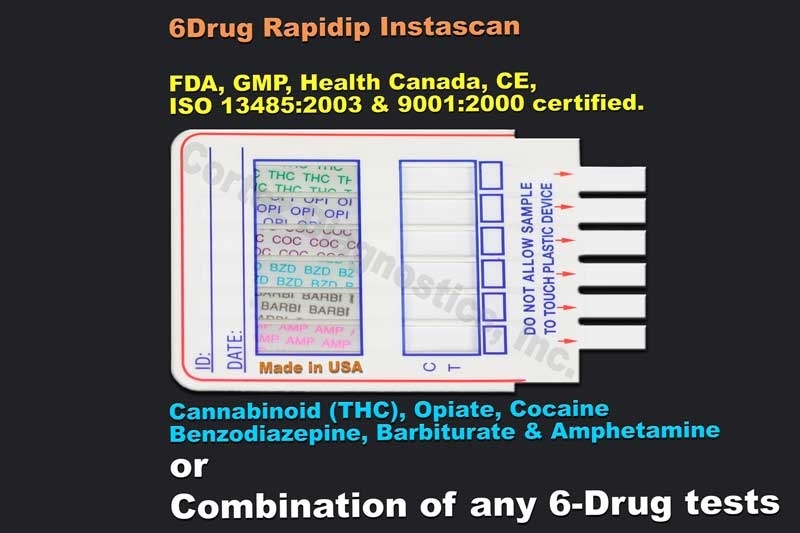 This 6 panel drug test - (AMP) Amphetamine drug test, (BZD) Benzodiazepine drug test, (COC) Cocaine drug test, (MET) Methamphetamine drug test, (MTD) Methadone drug test, and (MOR) Morphine drug test is available in cassette, strip, or cup format.